“Exigencies Of Survival” is an indoor percussion show is about an urgent need to survive. Students face trials and tribulations every day, but adults seem to forget what it was like as a young person. This show exemplifies that ongoing struggle, ending with hope as they conquer their need to survive. The music selection came from a percussion student’s recommendation. It is based on musical selections from the artist Ruelle. Exigencies Of Survival was the 2018 indoor show for John F. Kennedy High School in La Palma, CA. 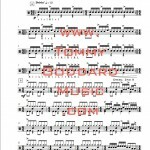 The 20 different percussion parts included are: Glockenspiel, Crotales, Chimes, Xylophone, Vibraphone (1 & 2), Marimba (1 & 2), Electric Piano, Synthesizer, Electric Bass, Timpani, Percussion/Accessories, Cymbals, Drumset, Snareline, Tenorline, and Bassline. If you need anything adjusted/arranged to fit your exact ensemble, please let me know how I might accommodate. Extra charges for this might apply. 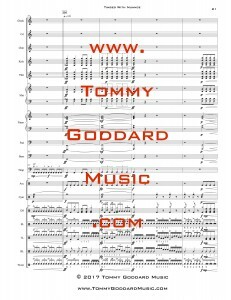 What began as an arrangement of one of my favorite rap/hip hop songs, resulted in an explosion of sounds, rhythms, key changes, grooves, and rudimental “licks,” being tossed around the ensemble. 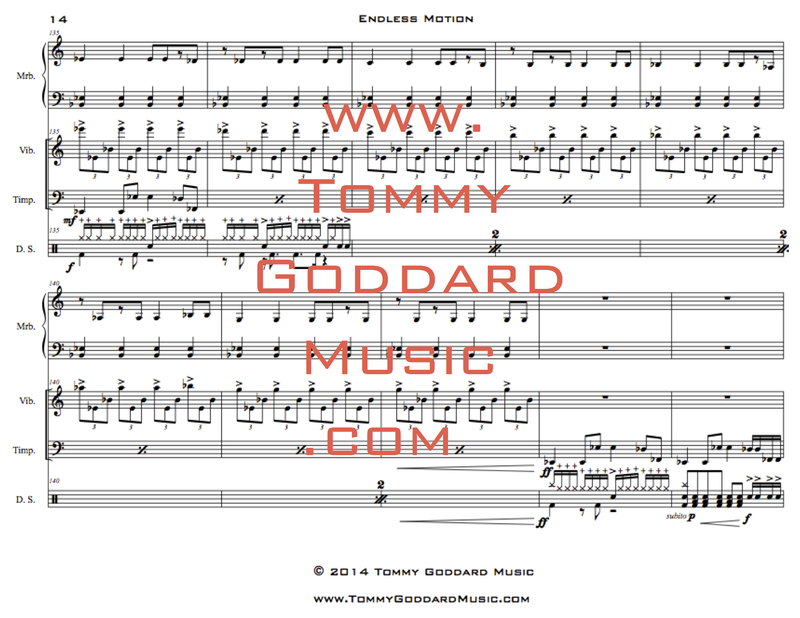 You can hear the tonalities shift gradually and quickly at different times. Lots of virtuosic mallet runs and drum solos are prevalent throughout. 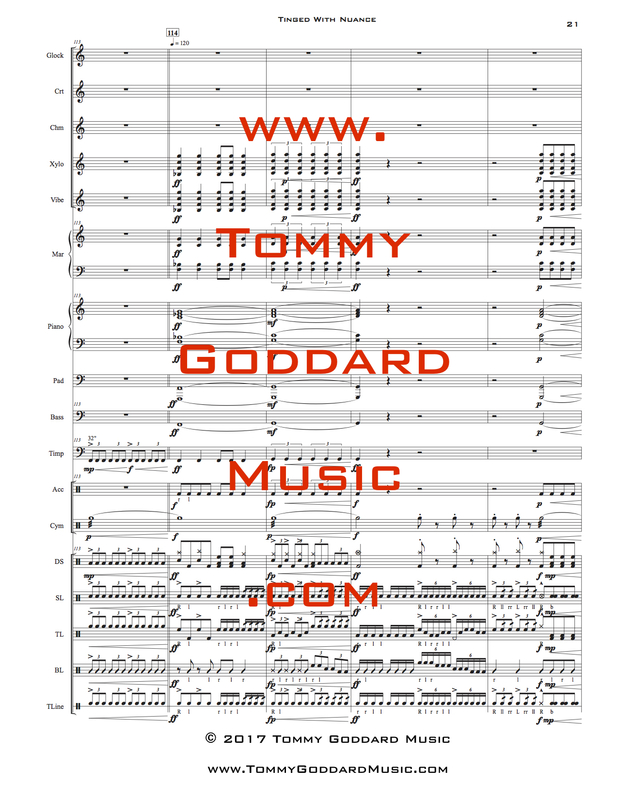 This composition was written to be used in indoor percussion competition. Tinged With Nuance was the 2018 indoor show for John F. Kennedy High School in La Palma, CA. 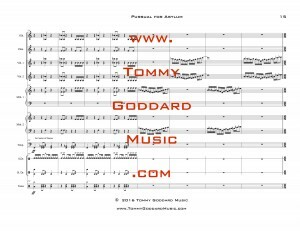 The 17 different percussion parts included are: Glockenspiel, Crotales, Chimes, Xylophone, Vibraphone, Marimba, Electric Piano, Synthesizer, Electric Bass, Timpani, Percussion/Accessories, Cymbals, Drumset, Snareline, Tenorline, Bassline, and Tom Line. If you need anything adjusted/arranged to fit your exact ensemble, please let me know how I might accommodate. Extra charges for this might apply. 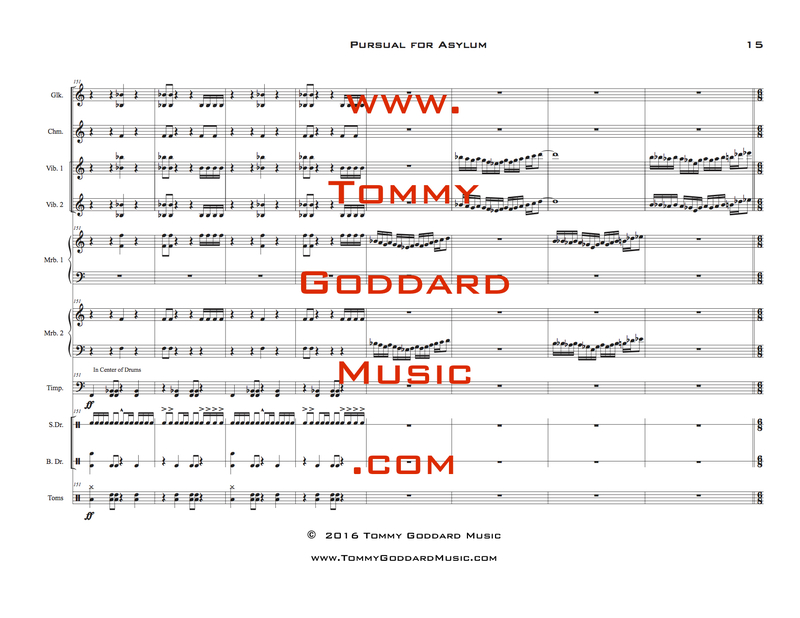 Pursual For Asylum is a 10 piece percussion ensemble composition that includes the instrumentation of: Glockenspiel, Chimes, Vibraphone (2), Marimba (2), Timpani, Snare Drum, Concert Bass Drum, and Percussion. The mood of this piece makes you wonder if and when you might find safety and solace, amidst a dark and dangerous night. Will you prevail and beat evil? 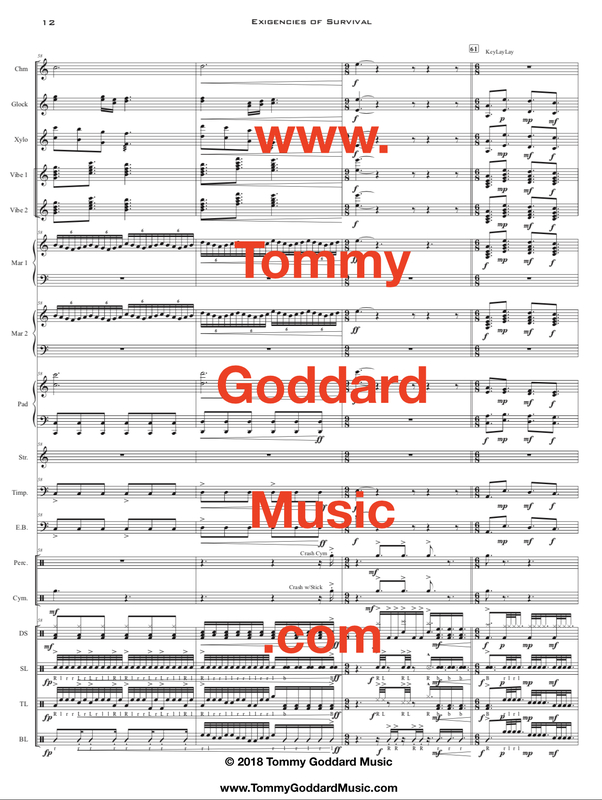 This composition was written about the exploration of good and evil, to see who might win. Listen to find out! Endless Motion is a percussion ensemble quartet that includes the instrumentation of: Marimba, Vibraphone, Timpani, and Drum Set. The melodies and harmonies of the three tonal instruments, mixed with a funky groove underneath, make this solo captivating. 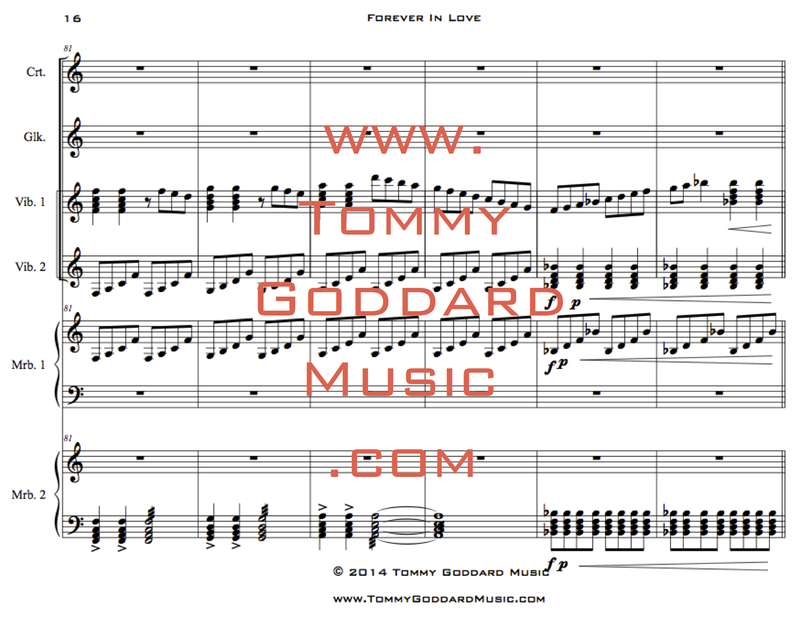 Forever In Love was originally written as a piano solo for Tommy Goddard’s wife when she walked down the aisle in their wedding. 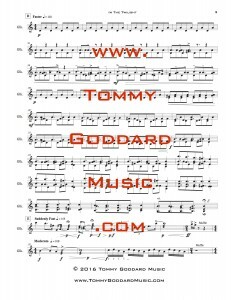 This piece was arranged for a keyboard percussion ensemble quartet that includes the instrumentation of: two Marimbas and two Vibraphones. The singable melodies and harmonies will stay in your memory for a peaceful, long time. 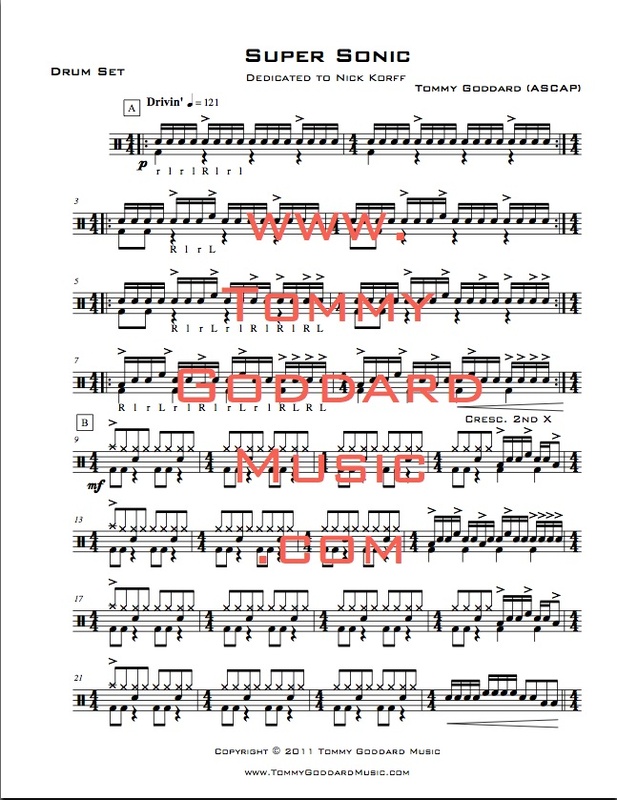 Tommy Goddard’s award-winning rudimental snare drum solo! The tempo expressions, metric modulations, intricate rhythmic phrasing, and flashy stick visuals all mixed together, make this solo unique and memorable. 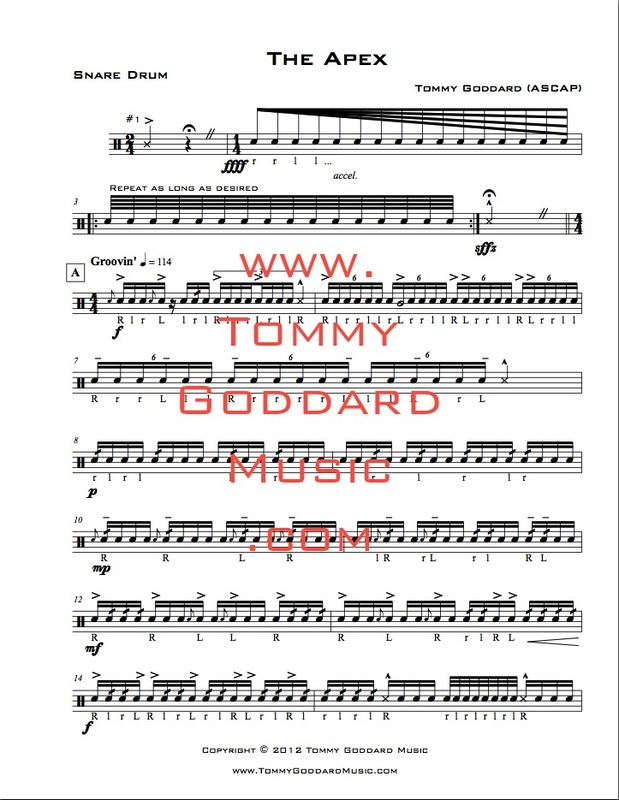 This drum set solo was designed for funky grooves and fills being performed with contrasting dynamics. Rhythms are constantly going back and forth between triple and duple time, which add complexity of syncopation. 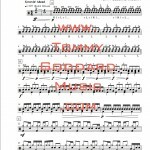 This drum set composition is dedicated to my former student, Evan Gray. 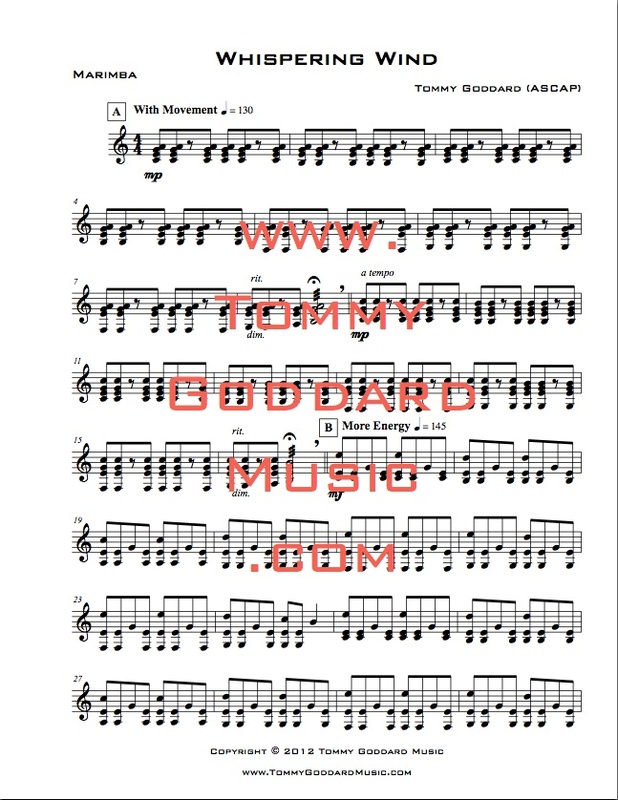 This drum set solo was designed for grooves and fills propelled in forward motion. 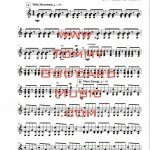 It focuses on feeling the rock groove followed with 16th note fills intertwined throughout. 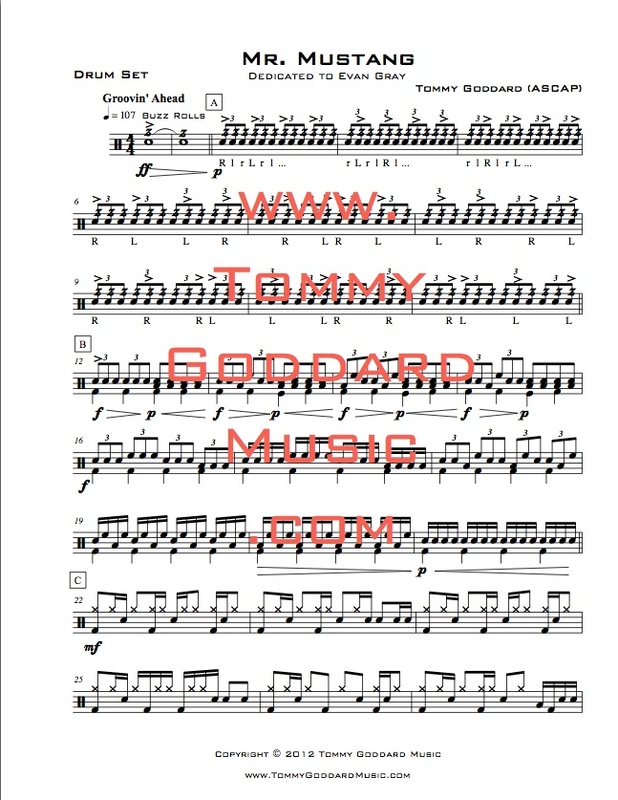 This drum set composition is dedicated to my former student, Nick Korff. In The Twilight is a glockenspiel solo, utilizing two glockenspiels, where the right glock is placed in front of and to the right of the left glock. This positioning makes it easier to play this piece with its dissonant harmonies, melodic juxtaposition, and muffling technique. 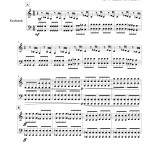 This solo is a great piece for a solo competition, will stand out from other compositions, and will be a fun challenge, both rhythmically and melodically. 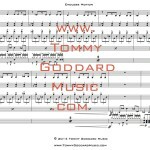 Whispering Wind was written for the young four mallet keyboardist. This solo utilizes double vertical strokes, double vertical rolls, single alternating strokes. Tempo expressions are written as a point of reference, but pushing and pulling the tempo truly captures the personality of how the wind blows. 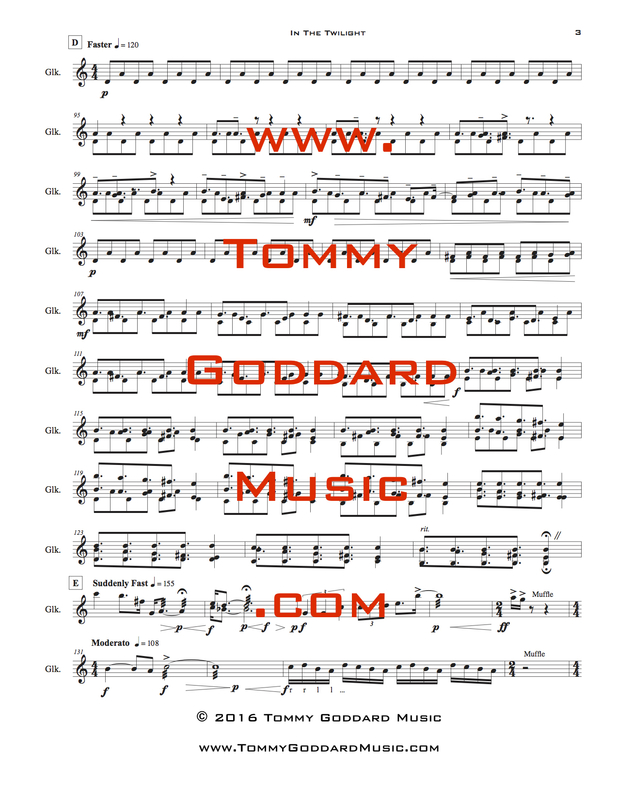 The dynamic contrast and singable melodies, make this solo catchy and memorable. 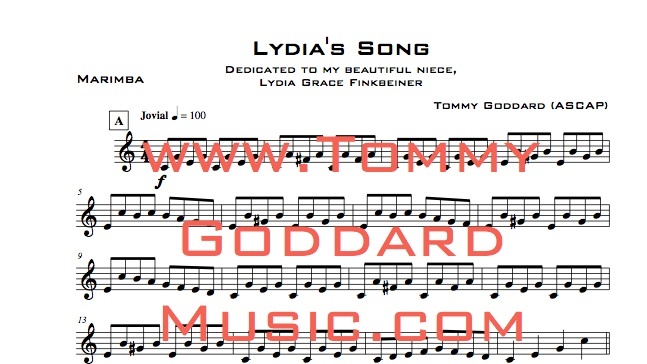 Lydia’s Song was written as a lullaby for Tommy Goddard’s beautiful niece, Lydia. 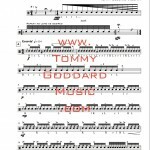 This solo was composed for the young percussionist, dealing with only simple rhythms and very few accidentals. 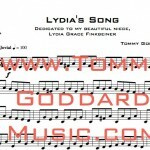 The use of simple melodies makes this solo easily singable and memorable. Goddard’s intention was to capture the sounds that relate directly to what we think of when looking at a brand new baby: soft, sweet, delicate, fun, and beautiful. Lugubrious Legatos was written by accident while practicing the piano. 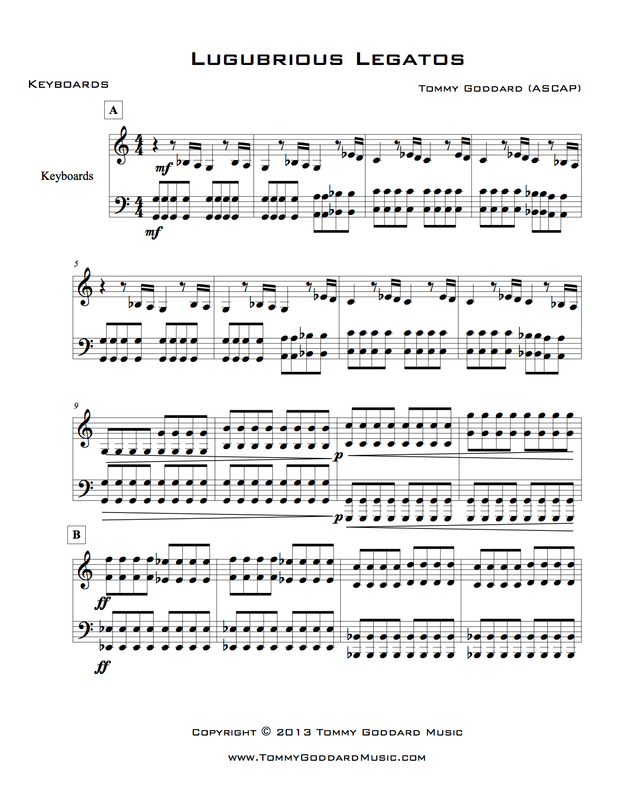 It is a mallet keyboard exercise that utilizes legato strokes. Legato strokes use an up and down motion, relying on the rebound of the mallet off the keyboard bar. This short exercise is very catchy and is delightful to practice! 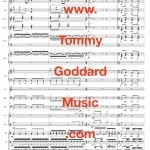 You may download this composition for free by clicking on the blue title above to the left. 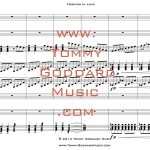 You can also visit my digital store at www.TommyGoddardMusic.Storenvy.com.